Big Leather Couch: What's Trending? Everything and everybody seems to 'trend' nowadays. GO over to my email on Yahoo and...you got it...subjects TRENDING put right there for me to be intrigued and immediately clicking on the links. I looked at the list and decided, OK sparky, time to check out why these fascinating people are TRENDING. Now, to be honest, a couple of them, I had no idea why these subjects were TRENDING, but the majority...I had no clue. 1. Zsa Zsa Gabor - About her hip surgery and her recovery and we learned "Zsa Zsa Gabor's husband thinks she'll be watching "Jeopardy" again in no time." 2. Linday Lohan - Yup, you got it..off to jail today (Tuesday). When the page opened, I thought the picture showed Lindsay snorting a little coke, but it was just her with her hand in front of her mouth! 3. Whooping Cough Vaccine - A story whether the vaccine can cause seizures. It was asked on a forum board on a medical site. It appears the alarm is a tad overblown. 4. Lucille Ball - Now why is the great red-head TRENDING? Seems her daughter Lucy has stopped a bunch of itmes that are being auctioned. What I do not get is why the widow of Lucy's SECOND HUSBAND is getting to do this...those kooky hollywood types! So, is your trip through the interwebs directed by TRENDING lists...all the time, sometimes, never? I guess I'm not very trendy. I don't care much about any of the "trending subjects." Ha! Here's a surprise ... I've never looked at a trending site. DIANNE: Think that will happen? DANA: Well, until last night neither had I...but I needed a subject for the post! Never. Ever. I am way too much of an individual. I like it that you think pretty much like I do; not interested in the celebrities and wanna be celebrities. Ehhh.....I don't get it. 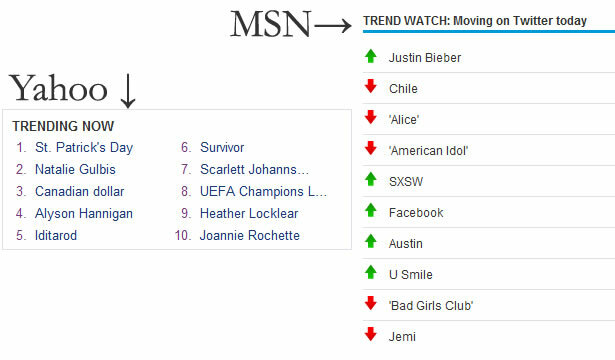 Is "trending" supposed to be what everyone is reading or most sought after news topics? If so, then I'm not impressed with the example list. Huh. Or maybe it's just me. I'm just not on the ball today, intellectually speaking. For a second I thought Tiger Woods had a stroke. Yeah. I'm a sports girl. Can ya tell? The only time I actually pay attention to any of those lists is when a name catches my eye and I wonder if they've died.